Feb. 23, 2018 | Feb. 23, 2018 | The public is invited to hear internationally renowned neuroscientist, neurosurgeon, author and inspirational Latin-American figure Alfredo Quiñones-Hinojosa, M.D., at noon March 6 at the University of Arkansas for Medical Sciences (UAMS). The free lecture will be held in the I. Dodd Wilson Education Building auditorium. Quiñones was invited as the keynote speaker for the Robert E. McGehee Jr., Ph.D., Distinguished Lectureship in Biomedical Research. 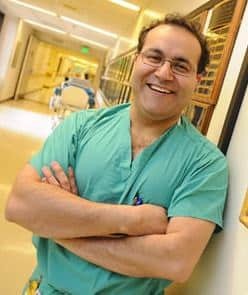 Quiñones is the William J. and Charles H. Mayo Professor and Chair of Neurologic Surgery in the Brain Tumor Stem Cell Research Laboratory at the Mayo Clinic in Jacksonville, Florida. Previously, he served as a neuroscientist and neurosurgeon at Johns Hopkins Hospital in Baltimore, Maryland, for more than a decade. His life’s work has been dedicated to finding a cure for brain cancer. Quiñones came to the United States as an undocumented immigrant from Mexico in 1987 at the age of 19. He was unable to speak English and worked as a field hand, painter and welder but soon set his sights on something bigger, eventually graduating from college and medical school. By 1992, Quiñones secured a scholarship to the University of California, Berkeley, where he majored in psychology. Still struggling with English, he gravitated toward math and science courses and found key mentors in the neurobiology lab and the university’s Hispanic Center of Excellence. Quiñones’ grandmother in Mexico was a village healer and inspired him to go into medicine. He applied and was accepted to Harvard Medical School, where mentorships again played a key role. During his years at Harvard, he became an American citizen, completed multiple research fellowships and was honored academically. He gave the commencement speech for his Harvard medical class of 1999. Quiñones continued to climb to greater heights in his career and documented his journey in his 2011 biography, “Becoming Dr. Q: My Journey from Migrant Farm Worker to Brain Surgeon.” Disney and the actor Brad Pitt’s production company, Plan B Entertainment, are developing Quiñones’ story into a movie. The McGehee Distinguished Lectureship was created in 2011 as an enduring gift from an anonymous couple to benefit UAMS and the state by making it possible to invite leading biomedical researchers to share their knowledge and work with students and faculty.